Meow! Greetings and salutations to all you cats and kittens out there from your Administrator of Excellence, Edgar Excellence! Happy Independence Day! I hope you had a great time celebrating our country’s fierce fight for independence and you join us next Saturday night when we use our paws and claws to fight for our independence! Last month, we presented a double-header of Excellence action with “Flea” and “Tick”. Being the first feline wrestling promoter, sometimes putting together a show can be challenging (even though it’s rewarding). “Flea” and “Tick” weekend was my biggest test to date. Thank you to all the Excellence fans who joined us for what turned out to be our Starrcade. There was singing, flying, and fun times. On Friday night at “Flea”, Howie Timberché serenaded the fans at Intermission and the Excellence locker room joined in. I have a beautiful howling voice, but Howie has a soulful voice too. Francis Kip Stevens and The Abominable CPA, together known as the The Breakfast Club, were victorious against Danger Jameson and Rembrandt Lewis, who can’t seem to cut a break. Kobald put a the good fight, but lost to the devilish and deceptive Jeremy Leary of Blitzkrieg Pro. I was a happy kitty when I saw Kobald win. It was a bit of revenge for me against that creep Leary. The Boar of Moldova soundly defeated Jimi Blaze and Blind Rage won his ninth point in the Excellence Championship Series (ECS) by beating Ken Broadway. Icarus flew over Havoc to score a victory. Vanity beat Karen Q. and won the privilege of wrestling “Lady Excellence” Deonna Purrazzo at “Tick”. When EPW’s two undefeated teams met, Too Many Cooks (Assistant Chef Smoothe Blackmon and Sloppy Joe) defeated One Night Only (Anthony Gangone and Marq Quen) via count-out. In the main event, Gran Akuma was victorious over our Friendly Neighborhood Psychopath Smiley. On Sunday afternoon at “Tick”, Vanity tried to make the best of her opportunity, but lost to Deonna, who had a run in with Blind Rage. Rage beat Hallowicked in a farce of a match that could be described with the distasteful phrase “finger poke of doom”. Offended by the disgraceful scene, Danger and Rembrandt came out and challenged the two nightmare warriors. While they fought bravely, Blind Rage and Hallowicked were victorious. The Boar of Moldova and Kobald, master of the gore and spear respectively wrestled to a double count-out. The bruiser Havoc got back on the winning path with a victory against Clutch Adams. One Night Only defeated Too Many Cooks, ending their undefeated streak. Each team is tied and has one win against the other, I’m a curious cat, so I wonder who would come out on top if they meet a third time? 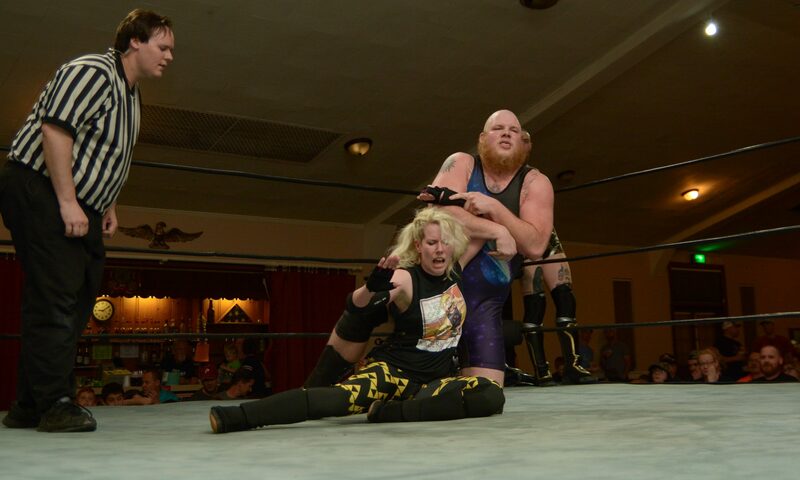 And two more wrestlers earned entry in the ECS – Icarus won his place by beating long-time rival and former partner Gran Akuma and Oleg the Usurper beat Smiley to earn his. Coming up this Saturday, it’s “Paws & Claws: The Fight for Independence III”! The fur will fly in Sellersville, PA at the Forrest Lodge when the doors open at 6:30 and the show starts at 7 pm! Tickets are $20 for front row, $15 for general admission, and kids are free with a paid GA ticket. Ken Broadway, Clutch Adams, Jimi Blaze, and Danger Jameson will battle in a four-way match. Ken Broadway wants to find his stride. He needs to qualify for the ECS or else he’s out of Team Akuma, but his three opponents want nothing more than to get their first win in the series. Rembrandt is on a roll in singles competition with a win over his partner Danger at “Smelly Cat”, but Havoc has been devastating since debuting and winning the “Turkey Tumbler” at “20% Gratuity” last year. Four of the five men to qualify for the ECS will be in tag action. Icarus and Oleg the Usurper will fight Hallowicked and Gran Akuma. This is the first-time these four wrestlers have teamed up and bragging right are on the line. And in a huge match up, Smiley and Blind Rage will go to war, with the prize being their 10th victory and entry into the Excellence Championship Series! Want to see matches and footage from our live events, like “Flea” and “Tick”? Want to see 5 Minute Matches and hear from the stars of EPW? Want to know more things Blind Rage hates? Visit our YouTube Channel! If you love Excellence, like our Facebook Page and follow our Twitter for updates too! Our website at www.excelleceprofessionalwrestling.com and there you can find updates on the ECS and event results! Friend me, your favorite feline in wrestling, on Facebook! And look for more missives from me, Edgar Excellence, the Head Cat of Excellence!